Why is Mohammad Hafeez not Playing for Pakistan? I really wonder what Mohammad Hafeez has done wrong to not be a part of Pakistan's ODI team. Just last year he was an integral part of Pakistan's Champions Trophy winning team. He played an instrumental role in propelling Pakistan to 338 in the final with a smashing unbeaten 57 off 37 deliveries. It seemed like Hafeez had found a new home in the middle order. Following on from the Champions Trophy, Hafeez hit a couple of 30s against Sri Lanka including an unbeaten one, also while batting in the middle order. Then in the series against New Zealand, where no Pakistan batsman really clicked, Hafeez had scores of 60 and 81, again while batting in the middle order. Those were the only two occasions that Pakistan surpassed a score of 245 in the entire series. When Pakistan played again, a 5-match series against Zimbabwe, Hafeez found himself on the bench. He did not get a single game on tour. Come the Asia Cup and Hafeez was out of the squad. So after giving a solid consistent middle order performance over one year, Hafeez first found himself on the bench and then out of the squad altogether. And I really do not understand why! If the Asia Cup proved anything was that Pakistan dearly missed Hafeez's services. Not only would he have strengthened Pakistan's middle order, he would have provided great value through his bowling. His replacement in the XI, Asif Ali, is at best a T20 batsman. He definitely is not ODI top 6 material and it was apparent that even the team management thinks so when they decided to send Shadab in at the fall of the 4th wicket inside 20 overs. Hafeez's inclusion the XI will not only strengthen Pakistan's middle order, it will give them an additional bowling option, and it will also allow them to include Asif Ali's hitting prowess at number 7. That way Pakistan can actually field an ODI team with enough batting till number 7, followed by their allrounders, spinners, and pacers. For those that feel that Hafeez is past his best and does not belong in Pakistan's ODI XI, here is a look at the performance of Pakistan's batsmen since the start of 2017. That is actually a great record for someone who has been floating around numbers 4-6 for the past year or so. The records of Babar, Fakhar, and Imam are inflated because of the run spree they all had against Zimbabwe, a series during which Hafeez warmed the benches. If we exclude that series from this analysis, Hafeez's performance relative to the others looks even better. In fact he averages better than Pakistan's current most popular batsman - Fakhar Zaman. 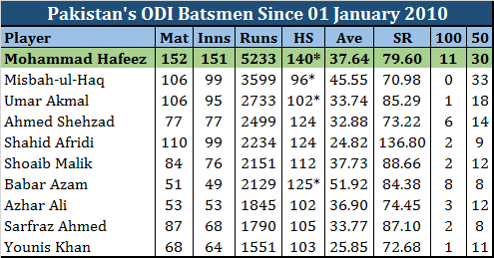 If one takes a look at the performance of Pakistan batsmen in ODIs in this decade, you may be surprised to realize that Mohammad Hafeez has been Pakistan's highest run scorer, as well as, their most consistent ODI batsman. During this 8 year and a bit period, Hafeez has played the most ODIs for Pakistan and scored the most ODI runs for Pakistan. Only Misbah Ul Haq and Babar Azam have a better average than him during this period, among all batsmen with at least 1,500 ODI runs. 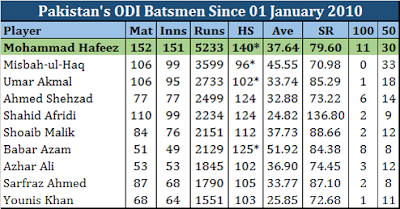 Hafeez is also far ahead in the number of centuries for Pakistan during this period with 11 ODI centuries. And he has scored them against the likes of England, New Zealand, and India besides bashing the Sri Lankans and West Indians. Then why is Hafeez out of this ODI Team? It definitely cannot be due to cricket. There is probably something else brewing. Issues with the coach or management perhaps. Maybe a tiff with the captain. But whatever it is, for the sake of Pakistan cricket, it is better if this matter is resolved and Hafeez is brought back into the fold as Pakistan can really do with his services.